Loch Lomond and The Trossachs National Park is the area of of Argyll and Bute, Perth and Kinross, Stirlingshire and West Dumbartonshire that lies within the Loch Lomond and The Trossachs National Park boundary. 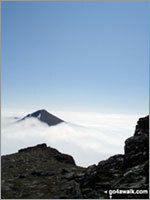 With a total area of 1,865 km² (720 sq mi), Loch Lomond and The Trossachs is the fourth largest in the UK. The main places to go walking from are: Aberfoyle, Ardlui, Arrochar, Balmaha, Callander, Crianlarich, Inverarnan, Inverbeg, Inveruglas, Killin, Lochearnhead, Lochgoilhead, and Tyndrum. Loch Lomond and The Trossachs in Scottish Gaelic is Pàirc Nàiseanta Loch Laomainn is nan Tròisichean. NB. Some online resources claim there are 21 Munros either within, or on the border of the National Park when there are in fact 22 - Meall Glas (Loch Tay) being the poor lost long forgotten mountain.